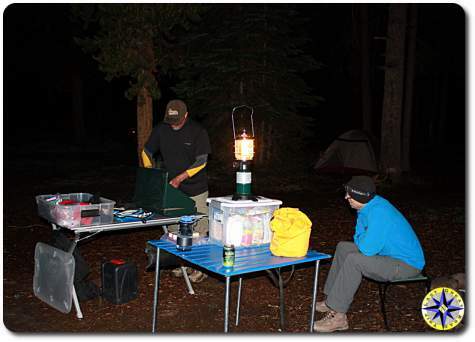 Getting ready for the Rubicon Trail off-road adventure has us going in all directions… meals on the trail is one of them… Rule #1 on the trail… everything, even cardboard re-hydrated with sweat and seasoned with dirt, tastes good after a long day wheeling on the trail…. but don’t let rule #1 get in the way of enjoying the finer things in life. All too often we seem to go from one extreme to the other… on the one end you have dehydrated back packing food, military rations, or a bag of beef jerky. On the other is the steak, baked potato and corn on the cob grilled over a giant propane blast furnace that has a Turkey deep fryer for Thanks Giving around the camp fire. Sure wheeling gives you a lot more choices than when you are having to hump all your food and gear in on your back, but there is a lot to be said for minimizing the weight in your rig and leaving a little room in the back for adult beverages and a good Cuban. Over years of backpacking and driving off-road I have achieved a type of cooking that works for me. It works because I can meet all my needs and still enjoy eating well in the outdoors. On the trail I hate clean up. I hate complicated. I hate having to spend too much time in the kitchen. I enjoy simple prep, easy cooking and complex flavors. One pot meals work best for my needs… cook in the pot that you eat out of and clean up becomes a breeze. Coffee… Starbucks has seen to it that our national addiction to caffeine is fully developed. Like a junkie on the street when it hits 8:00 a.m. I’m jonesing for my second cup. Since I don’t bring my local barista to brew me the perfect cup of espresso, I’ve had to experiment. These days there are lots of new options out including, french presses, drip coffee packs, hand crank coffee grinders and even backpacking mini espresso makers. And They all work well but they also have one thing in common. They take work to set up, tear down and clean. On cold mornings, my pre-caffeinated energy level is at boiling water. Which brings us to Medaglia D’Oro instant espresso coffee. Yes I said instant. Medaglia D’Oro is rich, full bodied and smooth. You can make it as strong as you like and clean up is nothing more than licking the spoon. While I’ve tried a number of instant coffees, Medaglia D’Oro keeps showing up in my camp kitchen kit. One pot meals tend to rely on good stock for complex flavors as well as forming the base of the meal. Chicken or beaf boolean cubes seem to have two ingredients, salt and fat. Canned stock provide real flavor but you can not control the intensity without lengthy reduction time. Using Glace de Poulet Gold from More Than Gourmet delivers on both accounts. Requiring no refrigeration, Glace de Poulet Gold is a 20-times reduction of French chicken stock with deep, rich, toasted color and syrupy consistency. Simplicity of ingredients and complexity of flavors are the Yen and Yang of Asian cooking. 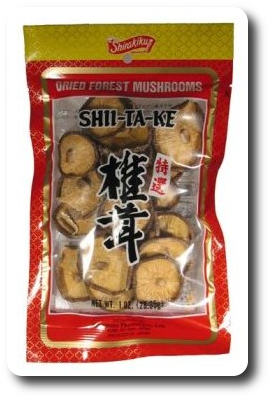 Dried Shiitake mushrooms , add a great earthy flavor and rich chewy texture. Adding dried Shiitake mushrooms to most one pot meals changes the character from bland to savory. 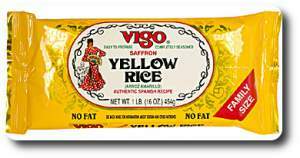 VIGO has two rice packs that I usually keep in my kitchen “Yellow Rice” and “Black Beans and Rice”. The yellow rice is a recreation of a Spanish classic complete with saffron. The black beans and rice is Cuban fare made easy. 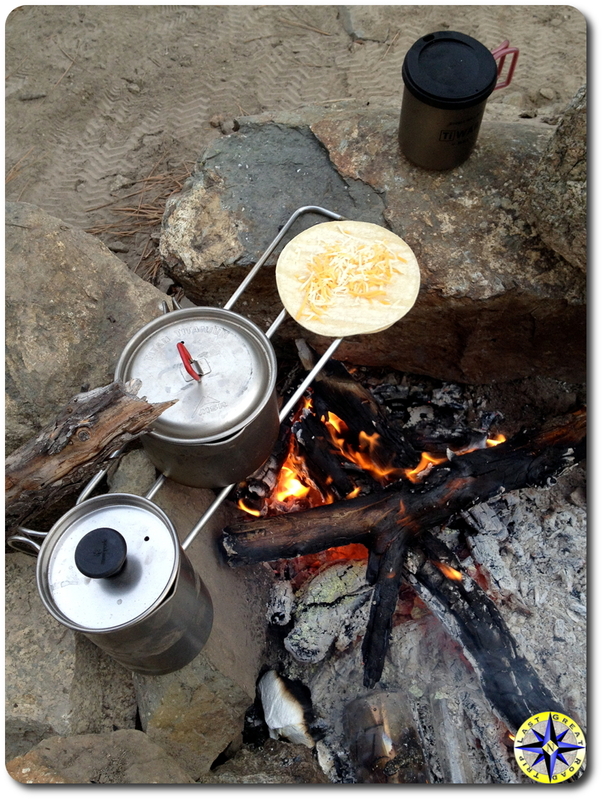 Both of these provide great flavor and will fill up the hungriest explorers on the trail. Top Ramen was always a staple in my backpacking youth. Filling, light weight and easy… but of course the main ingredient seemed to be salt and fat. These days I make my own ramen for the trail and it has much more flavor without all the salt. A big part of making good ramen (hand-pulled noodles) is starting with quality noodles. 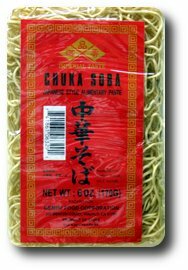 Most markets these days have a good Asian section where you can find chuka soba (Japanese style noodles). While beef jerky will give you the jaw muscles of a great white shark, it may not provide much to your meal. And trust me when I tell you, adding beef jerky to boiling water does not make soup. Brown water and soggy cardboard yes, but not soup. Landjaeger on the other hand… protein with a flavor punch. 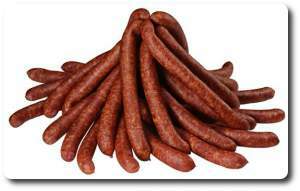 These dried sausages traditionally made in Southern Germany and Switzerland can be found at your local meat market or delicatessen. Consider it a bonus if you can find them made from venison or elk. While I can live on these alone, when you cut them up into rounds and drop them in the pot, they release all sorts of goodness. So with all this stuff good stuff what can you make? How about breakfast… Really this is one of my favorite breakfast items to get the morning started. Toss the water, Landjager, Glace de Poulet Gold and Shiitake mushrooms in a pot and bring it all to a boil. When the water boils, dump in the yellow rice give it a stir, cover and reduce to as low a simmer as you can with a camp stove. In 15 minutes give it a little stir and let it go for 5 more minutes or until all the water is absorbed. In the mean time you should be on your second cup of Medaglia D’Oro. Done right this dish will be creamy, full of texture and buttery rich with just a hint of smokey overtones. Really… or it will be hard, crunchy and burnt. Remember… Good cooks eat their mistakes. Good stuff, Paul. Just re-read this while thinking about a menu for an upcoming trip. Most of this stuff is available via Amazon! 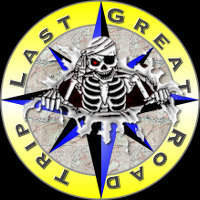 Have a great trip and let us know how it all turns out. 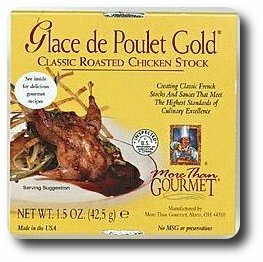 Sadly, I could only find a big (16oz) tub of Glace de Poulet Gold (on Amazon), but it refrigerates, so no worries. This was pretty tasty, with some hot ‘n’ spicey Landjaeger from Bavarian Meats outside the Pike Place Market. Good call, Paul! Glad you liked it… next time we’re on the trail, you cook and I’ll supply the chocolate and cigars. btw: I usually pick up Glace de Poulet Gold at central market. Yeah; I didn’t get a chance to get over to Central Market, alas. Next time.